Convert DWF to DXF. DWF Converter, DWF to DXF Converter. AutoCAD Design Web Format to Drawing Interchange Format Conversion. Convert DWF to DXF without the need for AutoCAD. 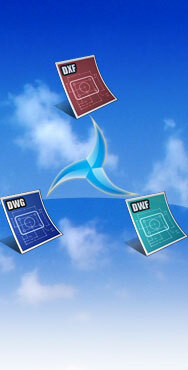 Upgrade or downgrade DXF, DWG, DXF versions click a few mouse clicks! Easy CAD Converter, previously known as DWF to DXF Converter, is capable of converting your CAD drawings from DWF to DXF without the need for AutoCAD-based products. Easy CAD Converter is more than a file format converter, and you can even upgrade or downgrade your DWG, DXF, DWF drawing files to a newer or earlier version to answer your specific needs, such as for better compatibility.